A new restaurant on Acre Lane this is the last in a trio of eating places just past Lidl that we would definitely recommend. 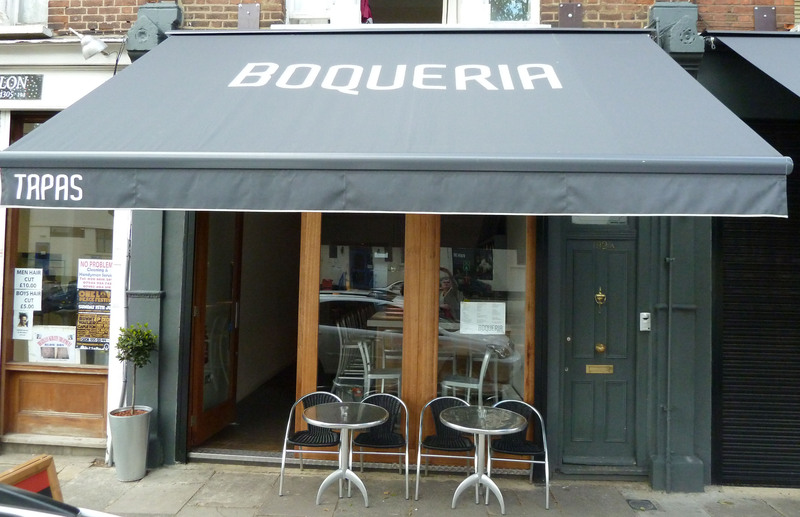 The restaurant consists of a bar which can be seen from the street and a restaurant area at the back which spans two shopfronts. The decor is minimalist and we really mean minimalist. This is not like the pop-ups in Brixton Village with their borrowed furniture. This restaurant has modern wooden tables for two people, pale wooden floors and few pictures. Boqeria opened just before Christmas so we went for a family outing for six and this was only a couple of days past the opening. We usually give restaurants a little time to settle down first but in their case the food was good and we thought we should alert people to the opportunity as it is easy to miss among the empty shops in that stretch of the road. As this was part of our Christmas celebrations we started with cocktails – not our best decision. The martini was mostly vermouth, the special mojito had too much sugar in it and the other drinks were even less like what we expected. However, the beer and the wine are fine – we had a reasonably priced Rioja. Tapas can be a slow meal – its really a discussion interspersed with food and that’s what makes it enjoyable. If there are only two of you in the party then having the food come two dishes at a time is fine. If there are six of you then the two dishes are emptied almost immediately and everyone is still famished and getting drunker. So our advice for the restaurant is to consider the size of the party and provide the dishes a few more at a time so. If this had happened then we would have probably ordered a few more but no-one was in the mood given the time each one took to appear and we did wait some time for an interesting pork belly dish that came alone about 20 minutes after all the other food had disappeared. An explanation of each dish would also have been helpful so we didn’t have to guess. Meal came to about £25 a head, but we were over indulging in the lead up to Christmas so that may have upped the price.